Asparagus is the tender young shoots of the species Asparagus officinalis, eaten, lightly cooked, as a vegetable. They shoots are called ‘spears’ and can be green, white or purple in colour. Asparagus is highly prized as a delicacy since the days of the ancient greeks and Romans. It’s sometimes referred to as ‘aristocrat of vegetables’. It belongs to the genus Asparagus which has about 200 species. The name officinalis means “of the dispensary” Asparagus is native to most of Europe, northern Africa and western Asia. It was initially grown by the Romans. After the fall of the Roman empire cultivation continued in Syria, Egypt and Spain. It was later cultivated in France in 1469, England in 1538 and North America around 1850s. From there it spread to the rest of the world. It’s presently grown worldwide as a much priced vegetable. The major product of asparagus is the tender young expanded shoot, called the spear, which is eaten lightly cooked. The wild asparagus has much thinner, edible shoots. Cultivated asparagus has undergone selective breeding and development of special growing techniques to produce greatly thickened fleshy shoots. Why is Asparagus so expensive? Asparagus needs careful tending. It has male and female plants. Male plants live longer and yield better harvest than female ones. In the first two years after sowing of seeds, a bed of asparagus remains unproductive until the third year when the shoots are thick enough to be marketed. Harvesting is done by hand and then continues for several seasons but the yield declines with time. In temperate climates the aerial parts senesce during autumn, and growth continues the following spring as the rhizome buds form shoots. They are two basic types of asparagus, white and green. The white asparagus is produced by earthing up the shoots and is more popular in Belgium, Germany and France. 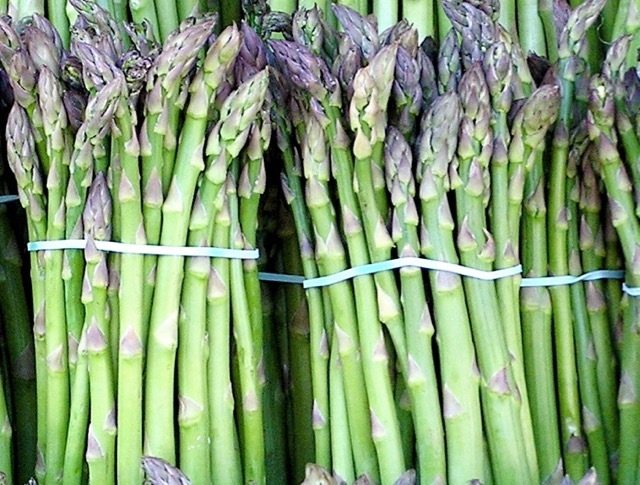 The green asparagus shoots are exposed to sunlight and are more popular in Britain, Italy and North America. The green colour may vary from light to dark green with a tinge of violet (purple). 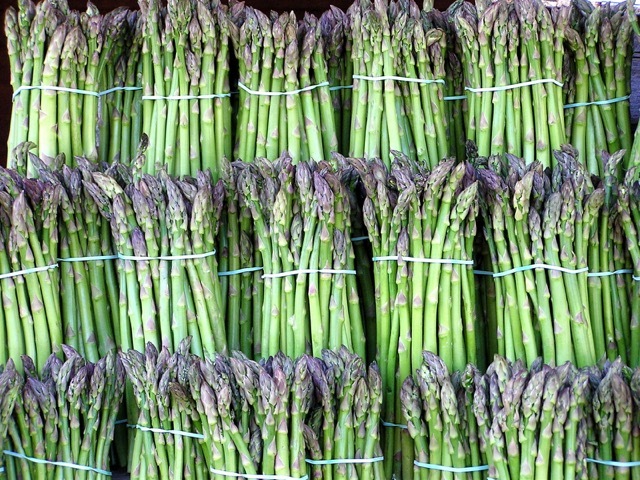 The highly recommended varieties are ‘Lucullus’ for white and ‘Jersey Giant’ for green asparagus. ‘Jersey Giant’ has purple tips and is purely male type (male is more vigorous than female). Other varieties include: ’California 500’, ‘Mary Washington’, ‘Martha Washington’, ‘Violette d’Argenteuil’. Asparagus is low in calories and very low in sodium. 100g (3.5oz) asparagus provides 70 Cal. It’s an excellent source of vitamin C; dietary fibre; B-vitamins, thiamine and riboflavin; vitamin A and Iron. Only young asparagus shoots are commonly eaten. Once the buds start to open (“ferning out“), the shoots quickly turn woody. If you buy slightly older asparagus, the tough woody ends should be removed. A gentle bend of each spear will result in natural snap, leaving a perfect tip for cooking. Asparagus can be boiled, steamed, sautéed, stir-fried, grilled, BBQ, or roasted in the oven. You can boil or sauté, 3-5 minutes; roast 15 minutes; or grill or BBQ for 5 minutes..The time will depend on thickness and length. Asparagus should be served lukewarm, not hot, with melted butter or hollandaise sauce or any other rich but mild flavoured sauce. Asparagus is also processed either by canning (or bottling) in brine or by deep-freezing. Canned asparagus is always blanched and therefore a significant amount of vitamin C leaches into the canning water. The canning water can be saved for soups or stocks but note that canned food has high amount of sodium. 10oz (285g) may contain up to 350mg of sodium. If available, buy low sodium versions. A single teaspoon of table salt, which is a combination of sodium and chloride, has 2,325 milligrams (mg) of sodium. Note: American Dietary Guidelines recommend limiting sodium to less than 2,300 mg a day or 1,500 mg if you’re age 51 or older, or if you are black, or if you have high blood pressure, diabetes or chronic kidney disease. In temperate climates the young spears are harvested in spring for a period of up to 12 weeks, starting in the second year after planting. Peak season in North America: April-May extending up to July. During fall/winter season Asparagus is imported form South America and is generally more expensive. Next What is Elephant Garlic? One of my favourites. Can hardly wait for spring to come around again!